The Amish Buggies are the main means of transportation for this misunderstood community. They use the buggy to transport everything from produce to themselves. The reason this form of transportation is preferred is so they can stay simple in their lives and have no reliance on the outside world. The Amish buggy itself has been transformed over the years to fit the needs and lifestyle of the Amish people. In the past, these buggies were made of wood and metal. Today fiberglass is used instead in many instances. This makes them more weather resistant and lighter. There are still several different manufacturers of the Amish buggies across America. Since the Amish are the largest customers of this specialty item, most are made near one of the many Amish communities. This way it is easier to sell their products. 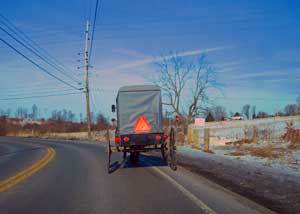 On average, an Amish buggy will cost between $4,300 and $7,200 and sometimes more. Some of the business's that sells these buggies includes I&J Manufacturing, Pioneer Equipment Inc, and Shady Lane Wagons. Because the Amish buggies have to share the road with other vehicles, there is a requirement of some safety equipment they all must be fitted with. There are lights fitted on the buggies so other drivers will more easily see them. There are also turn signals to help indicate the direction of travel for the buggy. At night there must also be a flashing light on at all times so approaching motorist will see them. These lights are run off a small battery that is fitted to the buggies. 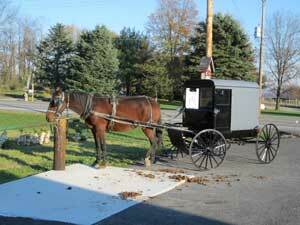 Today a person can purchase an Amish buggy that fits their needs and size horse. There are smaller carriages that can be pulled by ponies. There are also large wagons that can carry up to 12 tons of produce to the market if needed. The option of wooden, metal or rubber tires the buggies and wagons will be mounted on is also available. There are even a few with hydraulic brakes fitted on them to help in stopping the large loads. There are other specialty buggies that are used for specific purposes. The most obvious is the courting buggy. This is a two seater that is open all round. This allows for a young couple to take a ride and talk. It also provides no privacy so no hank panky can occur. The most common of all the Amish buggies are the family wagon. These look like a large box on top of four wheels. They can generally accommodate up to 8 people comfortable. Because it is all covered, it protects the occupants from road dirt and the weather. There are still many craftsmen in the Amish community that make Amish buggies, but they are mostly wooden ones. They are slightly higher in cost than their fiberglass competitors, but wood is easier to work with. Want to see more wooden items made by the Amish, visit https://www.amishtables.com/, through they are a hundred miles away from us, they are a friend of AmishQuilter. Today fancier horse drawn buggies still are made, but they are not preferred by the Amish people. Remember this is a community that shuns personal pride and a fancy buggy would be inappropriate.